Lin Tianmiao (Chinese: 林天苗; pinyin: Lín tīan míao; born 1961) is a contemporary Chinese installation artist and textile designer. Through her use of everyday objects, she explores the relationship of tradition and modernization. Growing up in China as well as being a woman are the two strongest voices that Lin communicates with and advocates for through her art. By using materials which are closely tied to the maternal responsibilities of a household, Lin connects her past to China's present. Lin Tianmiao was born in 1961 in Taiyuan, Shanxi province, China. Her father was an ink painter and master calligrapher and her mother studied and taught traditional dance. She earned a bachelor's degree in Fine Art from Capital Normal University in Beijing in 1984. Lin worked and lived in New York from 1988 to 1995. She now resides in Beijing. She lived in Brooklyn from 1988 to 1994. She returned to Beijing in 1995 and converted her home into an open studio which was an important venue for Apartment Art. Lin is married to video artist Wang Gongxin and has a son, Shaun. She lives in Beijing. Lin and her husband work together and he runs her website as well as is in charge of her publicity. They also collaborate on experimental exhibitions in their home that further investigate the materials that Lin is drawn to and often uses in her work. She received her BFA from Capital Normal University in 1961. Subsequently she studied at the Art Students League in New York City in 1989. Lin started her career as a textile designer and used the skills she learned later on in her work. She transitioned from textile design to art because she felt like design was limiting her creativity and suppressing her expression. Lin and her husband participated in and were involved with the Beijing Young Artists' Painting Society, which was contiguous with the '85 Art New Wave Movement. "It was more conservative, but it was also innovative" said Lin in an interview about her involvement in the Beijing Young Artists' Painting Society compared to the '85 Art New Wave Movement. Lin co-founded the Loft New Media Art Center in 2001. She had a 2006 residency at the Singapore Tyler Print Institute where she experimented with paper media and printmaking. Since the mid-1990s, her works have been included in every major international museum show on Chinese contemporary art. Lin is represented by Galerie Lelong, New York and Paris. In the 1990s, Lin created works with materials of contrasting textures. Her signature medium became undyed cotton thread. Lin also works in other mediums such as sculpture, photography, video and mixed media. More or Less the Same, 2011 combines hard and soft materials such as silk threads and stainless steel and demonstrates a balance in textures. In 2017, after a twenty year practice, she made a break from the traditional media she became associated with, instead choosing to use glass—a man-made material widely used in modern life—in order to take on challenges never attempted before. Her work analyzes dichotomies in a universally understood manner by translating concepts into tangible objects symbolically. Lin's work often deals with themes specific to women and while critics have compared her work to Western feminist art with its focus on the manifestations of domesticity, she has rejected that characterization. Lin is one of the first female Chinese artists to break ground and achieve international recognition from exhibits all over Europe to shows all over the USA and works in galleries everywhere from Australia to Canada. The contrast within the materials Lin uses creates a binary conversation about the human, and female, experience. Every subject Lin addresses in her art, she depicts in a black & white, cold & hot, binary conversation. Lin is best known for her installations. 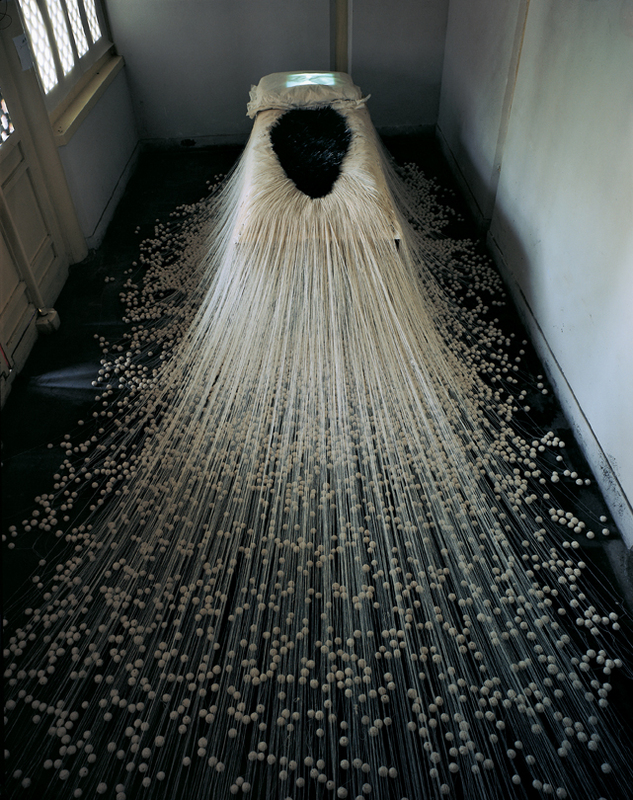 One of her earliest works, The Proliferation of Thread Winding (1995), included 20,000 balls of thread attached with needles to a rice paper-covered iron bed. In 2012, she made a series of works using a wooden frame, threads and synthetic bones; Minty Blue (2012) and Duckling Yellow (2012) were two works in the series that explored suppression and boundaries using symbolic colors monochromatically to keep the attention on the object. Systems Reaction(2018), the concept originates from the system of the human body and draws from a range of modern critical and political theory, as well as from contemporary psychology. ^ "Lin Tianmiao | artnet". www.artnet.com. Retrieved 2019-03-02. ^ a b c d e f g h i Suzuki, Sarah (2010). "Lin Tianmiao". Modern Women: Women Artists at the Museum of Modern Art. New York: Museum of Modern Art. pp. 405–406. ISBN 978-0-87070-771-1. ^ a b c d Pollack, Barbara (October 2012). "Wrap Artist" (PDF). ARTnews. pp. 86–93. ^ a b c d Wang, Peggy. 2012. 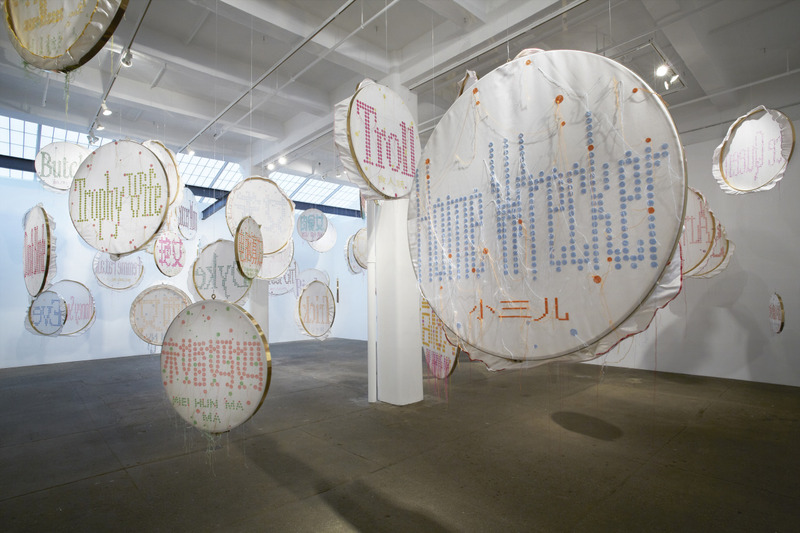 "Subversion, culture shock, "Women's Art": an interview with Lin Tianmiao". n.paradoxa. 2012: 22-31. ^ Caruso, Hwa Young (June 1, 2013). "Lin Tianmiao: A contemporary Chinese Woman Artist". International journal of multicultural education. 15. ^ a b c d "Galerie Lelong | Artist". www.galerielelong.com. Retrieved 2016-03-03. 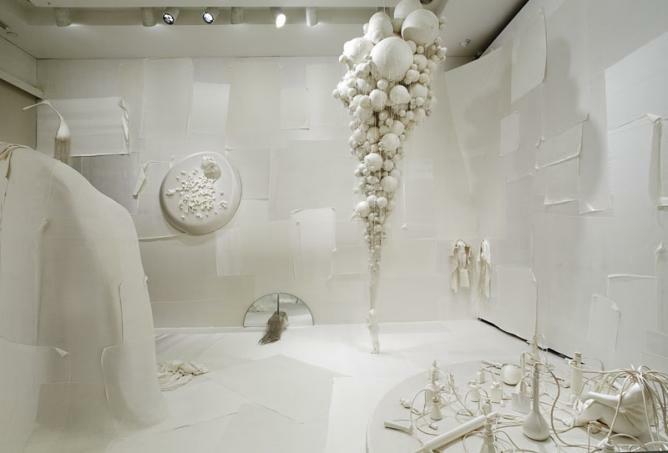 ^ a b "Lin Tianmiao: Systems | Exhibition | Rockbund Art Museum". www.rockbundartmuseum.org. Retrieved 2018-11-27. ^ 1. Smith, Karen (October 2012). "Woven Labors" (PDF). Art in America: 138–144. I looked in many books and catalogues about female artists to see if this was true but came to the conclusion that it was not. I had always judged life from my own experience as a person, who just happened to be a woman. ^ "Bound Unbound: Lin Tianmiao". Asia Society. Retrieved 2016-03-03. This page was last edited on 9 March 2019, at 13:16 (UTC).